How would you rate economic conditions in this country today -- as excellent, good, only fair or poor? Thinking about the job situation in America today, would you say that it is now a good time or a bad time to find a quality job? What is the most important financial problem facing your family today? Percentages total more than 100% due to multiple responses. 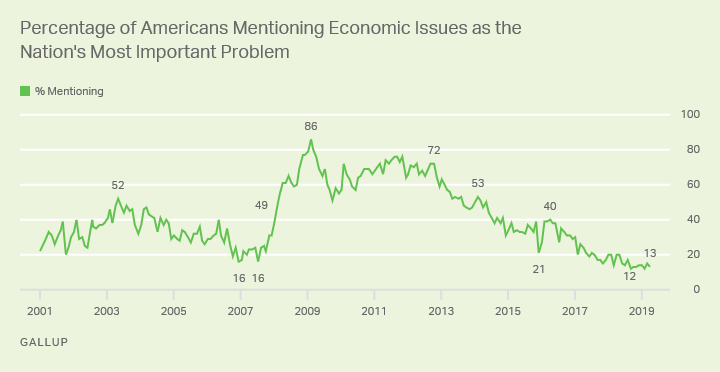 Americans' confidence in the economy dipped in March and April after surging in February, shortly after the end of the latest government shutdown. Americans are more inclined to see trade as beneficial than harmful to U.S. workers, 51% to 42%.